Inside 3D Printing: Peter Weijmarshausen Keynote #3D « Adafruit Industries – Makers, hackers, artists, designers and engineers! The third and final keynote at Inside 3D Printing featured Shapeways CEO Peter Weijmarshausen. 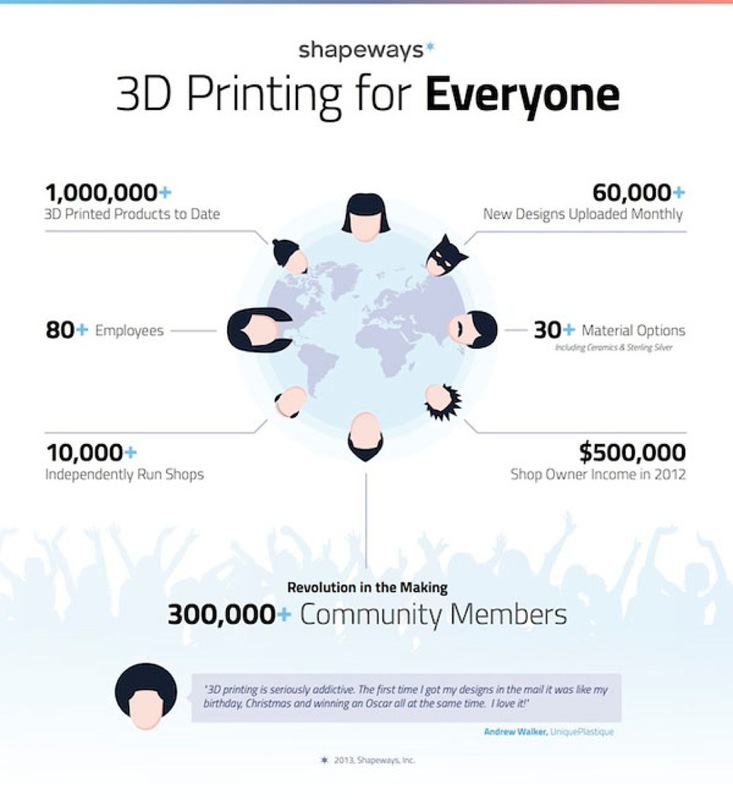 He shared about latest developments throughout Shapeways including at their NYC factory. Over 2000 new designs are submitted every day. The value of iterative product design — after you have released a product, customer by customer. How Shop Owners are paid for their designs. When we started in 2007, very few people had even heard of 3D printing outside of the engineering and design communities. It was mainly used for prototyping. Today, 3D printing has taken the manufacturing industry by storm and everyone is talking about this groundbreaking technology. President Obama even recently called out 3D printing as one of the important technologies that can bring manufacturing back to the USA. We believe that 3D printing is fundamentally changing the manufacturing ecosystem in its entirety – how and where products are made and by whom. For the last century, big companies were in charge: they determined what consumers wanted and made those products in large quantities using mass manufacturing. Now, thanks to 3D printing, those days are over. This technology enables everyone to create unique products on demand, putting the customer in control and localizing the manufacturing process. Peter Weijmarshausen is the Chief Executive Officer for Shapeways, the online marketplace and community for personalized production where anyone can make, buy and sell their own products. Custom-made products are created one-of-a-kind and on-demand in a variety of materials using the latest 3D printing technologies. Prior to Shapeways, Peter was the CTO of Sangine, where he and his team designed and developed satellite broadband modems and Director of Engineering at Aramiska, where he was responsible for delivering a business broadband service via Satellite. Earlier in his career, Peter worked as ICT manager for Not a Number where he facilitated the adoption of the widely successful open source 3D software Blender. His global expertise is in the fields of Entrepreneurship, Internet marketing and business development, 3D printing, designing and implementing scalable Internet services.